Punjab State Council for Science and Technology (PSCST) has given a notification of 01 Information Officer (ENVIS) Vacancy on the contract basis. The interested candidates can apply for the PSCST Recruitment 2018 within 15 days from the date of advertisement. PSCST Chandigarh Recruitment 2018-19 notification is out. As per the Notification, there is one Information Officer Vacancy. The educational qualification is Graduation in Science and Post Graduate Diploma in Remote Sensing/Geographical Information System. The upper age limit is 37 years. If you are looking for Govt. 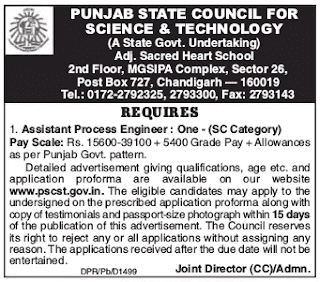 Jobs in Punjab State Council for Science & Technology then this article is going to be very helpful for you. The candidates should have graduation in Science and Post Graduate Diploma in Remote Sensing/Geographical Information System. The candidates should have 02-years working experience in the relevant field/area. The candidates should have good knowledge of computers and Punjabi up to matriculation level. The upper age limit is 37-years. The upper age limit is relaxable up to 45 years in case of persons already in the employment of Punjab, Government, other state government or the Govt. of India. The candidate should fulfill the upper age limit as on 01.01.2018. Rs. 29299/- including EPF & HRA per month. You can send your application in the prescribed format along with the self-attested copies of the testimonials and recent passport size photographs within 15 days to the department. Last Date: Within 15 days from the date of advertisement of notification. Date of Advertisement: 02 June 2018.